Model stitched on 10 Ct. Vintage Country Mocha Tula with Weeks Dye Works floss and DMC floss. Stitch Count: 31W x 66H. Shown with an Olde Brass Pear button. 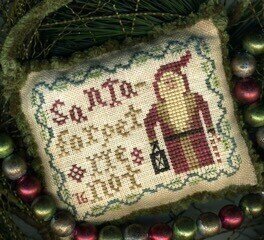 Stitch Count: 39x60. Comes with butterfly charm. 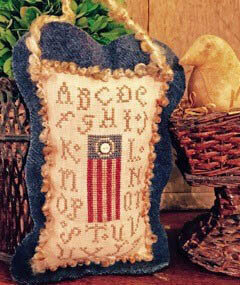 The pillow and the Hanging pocket are both stitched on 20 Ct. Putty using 3 plies over two threads. 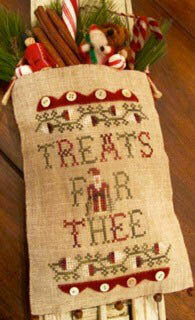 Ornament is stitched on 30 Ct. 18th Century Brown by R&R Reproductions using 2 plies over two threads. 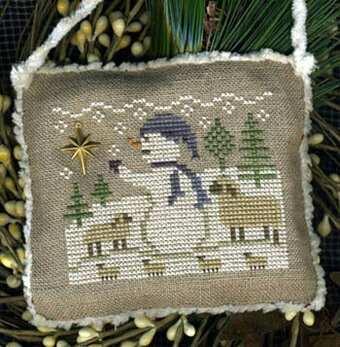 Stitch count for pocket is 35x90. "(Name of yhour choice) is a candy cane cutie". Model stitched on 30 Ct. Putty linen by Weeks Dye Works with Gentle Art Sampler and Weeks Dye Works threads. Stitch Count: 47W x 48H. Finishing instructions & pearl button included. Stitch count is 23W x 65H. Can be embellished with vintage style bells that you should be able to find something similar. Stitch Count: 46W x 50H. Comes with charm. Model stitched on 30 ct. Parchment linen by Weeks Dye Works with DMC floss and Weeks Dye Works floss. Stitch Count: 52x42. Model stitched over two on 30 Ct. Putty by Weeks Dye Works using DMC, Gentle Arts and Weeks Dye Work threads. (DMC alternates are 3033 3773 520 522 839 221 3721 420 3045 3772) Stitch count 59x45. 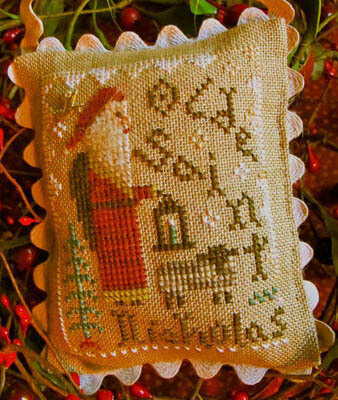 Model stitched over 2 threads on 32 Ct. Classic Homespun linen by R&R Reproductions with Weeks Dye Works floss, Gentle Art Sampler threads and DMC floss. Stitch Count: 61W x 43H. 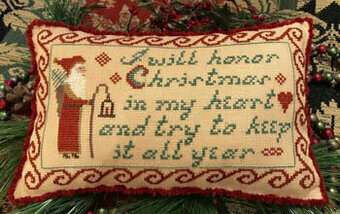 "I will honor Christmas in my heart and try to keep it all year" Model shown was originally stitched on 25 Ct. Sand Dublin linen, which is no longer available. 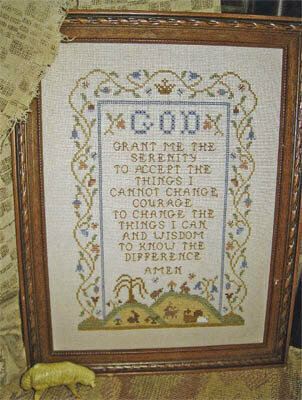 Great subsitute is 30 Ct. Parchment from Weeks Dye Works stitched over two using DMC & Rainbow Gallery Wisper. 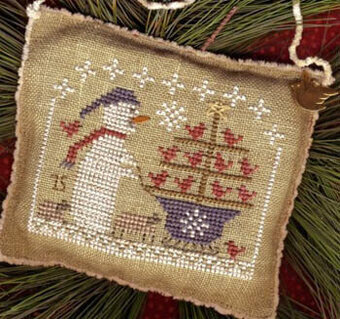 Stitch count 126x74. Stitched over two on 30 Ct. Putty by Weeks Dye Works using Gentle Arts, Weeks Dye Works, and DMC floss. Stitch count 113x39. Model stitched on 20 count Putty using Weeks Dye Works, Gentle Art Sampler Threads and DMC floss. (DMC alternates are 712, 739, 502, 3011, 3012, 924, 3768, 3858, 3790, 3755) Stitch Count: 27W x 68H. Model stitched on 32 Ct. Parchment linen by Weeks Dye Works with Gentle Art Sampler Threads, Weeks Dye Works, and DMC floss. 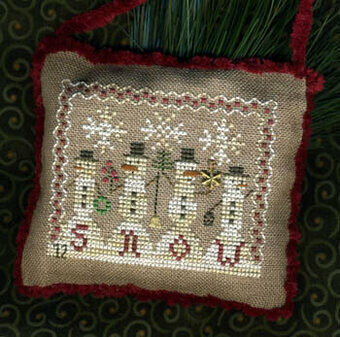 Model stitched on 32 Ct. Parchment by Weeks Dye Works with DMC floss, The Gentle Art Sampler threads and Classic Colorworks floss. Stitch Count: 53W x 42H. Stitch count is 99W x 114H. 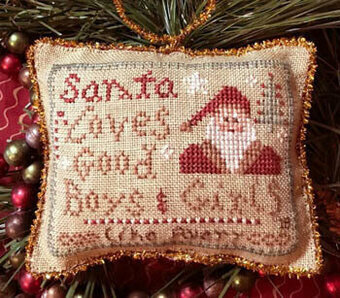 Model stitched over 2 threads on 32 Ct. Classic Homespun by R&R Reproductions with Weeks Dye Works floss, Gentle Art Sampler threads and DMC floss. Stitch Count: 59W x 46H. 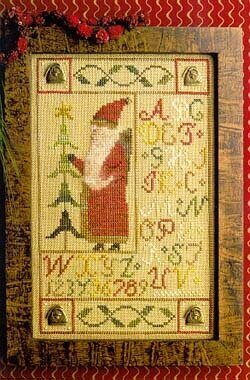 Model stitched on 32 count Mink using Weeks Dye Works, Gentle Art Sampler Threads and DMC floss. (DMC alternates are 221, 902, 924, 3768, 3031, 712, 739) Stitch Count: 103W x 35H. 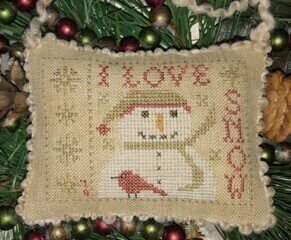 Model stitched over 2 threads on 32 Ct. Parchment linen with Weeks Dye Works floss and Gentle Art Sampler threads. Stitch Count: 42W x 81H. Model stitched over 2 threads on 32 Ct. Parchment linen with Gentle Art Sampler threads, Weeks Dye Works floss and DMC floss. 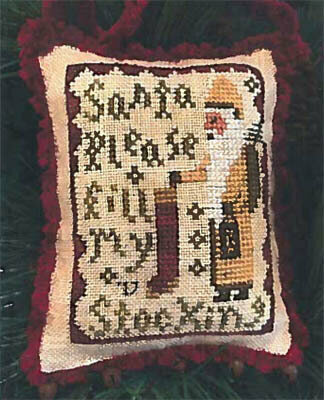 Stitch Count: 42W x 54H. "God grant me the serenity to accept the things I cannot change, the courage to change the things I can, and the wisdom to know the difference. Amen." Model stitched on 28 Ct. Jobelan with DMC floss. Stitch Count: 143H x 99W. 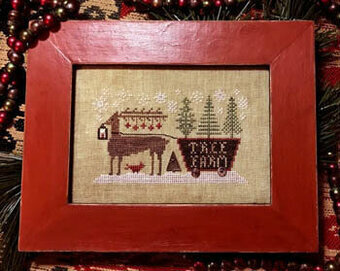 Framed model stitched on 18 Ct. Classic Homespun linen. 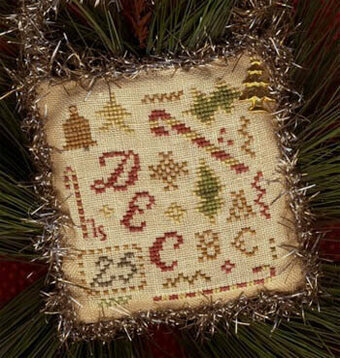 The small design is stitched on 28 Ct. Cream Cashel linen. Stitch Count: 27W x 68H. Both models use Gentle Art Sampler threads, Weeks Dye Works floss, and DMC floss. Model stitched on 30 Ct. Putty linen by Weeks Dye Works with DMC floss and Weeks Dye Works floss. Stitch Count: 53x43. Model stitched over two threads on 18 Ct. Classic Homespun linen by R&R Reproductions with Weeks Dye Works floss and DMC floss. Stitch Count: 55W x 71H. Finishing instructions provided. Model stitched on 30 Ct. Straw Linen with Weeks Dye Works, DMC floss, and Classic Colorworks (or DMC 830, 3045, 3021, 3022, 919, 975, 433, 801, 300, and 3777). 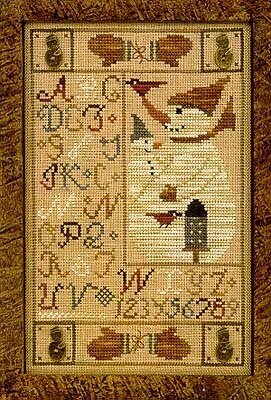 Stitch count 39x60. 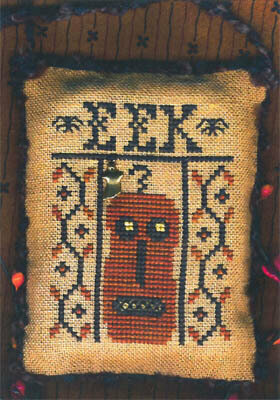 Needle case model stitched on 30 Ct. Mink linen by R&R Reproductions with Weeks Dye Works, Gentle Art Sampler threads and DMC floss. Stitch Count: 37W x 38H. Comes with mini brass star charm, tiny dove charm, and mini black buttons. 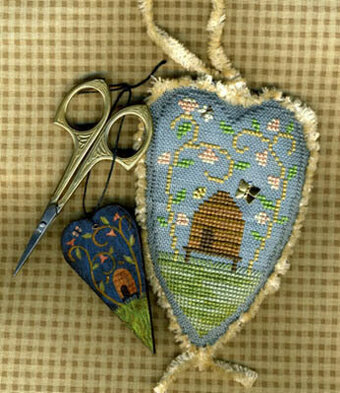 In addition to the needle case, pattern also included for a scissor fob made of wool. Model stitched on 30 Ct. Cappuccino linen by Weeks Dyw work with DMC and Weeks Dye Works floss (or all DMC 919, 975, 834, 3371). Stitch Count: 40W x 51H. 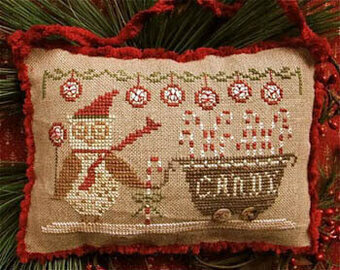 Shown with a brass charm by Homespun Elegance. 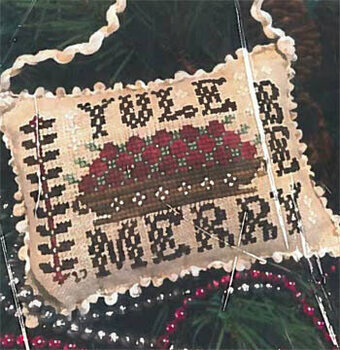 Directions for assembling the ornament are provided as well as the template for the felted wool backing. 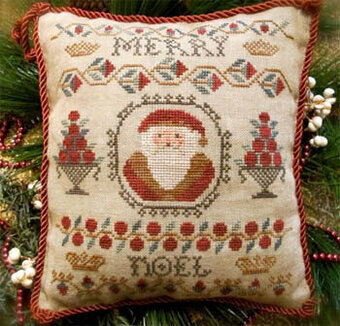 Model stitched on 30 Ct. Mink linen with Gentle Art Sampler threads, DMC floss, Crescent Colours, and Gentle Art Sampler threads. Stitch Count: 52W x 41H. Comes with a brass star charm. Model stitched on 30 Ct. Mink Linen by R&R Reproductions with Gentle Art Sampler threads, Weeks Dye Works floss, and DMC floss. Stitch Count: 44W x 53H. Shown with mini star brass charms from Homespun Elegance (not included). Model stitched over 2 threads on 30 Ct. Putty linen with DMC floss and Weeks Dye Works floss. Stitch Count: 64W x 42H. 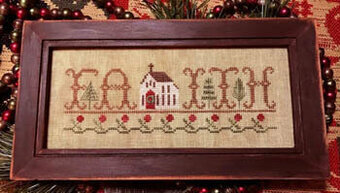 Model stitched over 2 threads on 32 Ct. Classic Homespun by R&R Reproductions with Weeks Dye Works and DMC floss. Stitch Count: 57x46.